The app will rely on a glucose monitor to transmit blood-sugar readings to the iPhone and Apple Watch. Medical device maker DexCom is developing an Apple Watch app that will allow diabetics to monitor their blood-sugar levels a bit more discreetly. The app will integrate with a glucose monitor the company already sells and will offer diabetics an easier way to check their glucose, said Jorge Valdes, chief technical officer at DexCom. “Diabetics really don’t want others to know they have diabetes,” said Valdes, adding that individuals with the condition check their blood-sugar levels approximately 50 times a day. To check their glucose levels now, people must use a handheld device that transmits data from the monitor and resembles an earlier version of an iPod Nano, he said. Using the app doesn’t mean a diabetic can ditch the handheld device. That equipment uses Bluetooth to send data from the monitor to an iPhone and Apple Watch. However, instead of pulling out the handheld or an iPhone to get a glucose reading, diabetics can look at the watch. The app also allows diabetics to share their blood sugar information with others, such as a parent or adult child, who also have an Apple Watch or an iPhone. The app shows a person’s glucose level, indicates if that level is either increasing or decreasing and offers a graph of glucose readings from the previous three hours. The iPhone and Watch display the same app information, but DexCom had to simplify the interface a little to accommodate the watch’s smaller screen, said Valdes. The app comes as the U.S. government is taking a more relaxed approach to regulating health IT apps and the mobile devices they run on. Last month the U.S. Food and Drug Administration issued guidelines for wearables saying that agency oversight wouldn’t be required if the devices were safe, promoted wellness and didn’t claim to treat medical aliments. The agency also eased rules around how data from a medical device could be shared with wearables and smartphones, a move that helped DexCom get the app ready in time for when Apple Watch sales begin, said Valdes. The eased rules also allowed DexCom to install a Bluetooth transmitter in the monitor’s handheld device so glucose data could be sent to an iPhone and the Apple Watch. 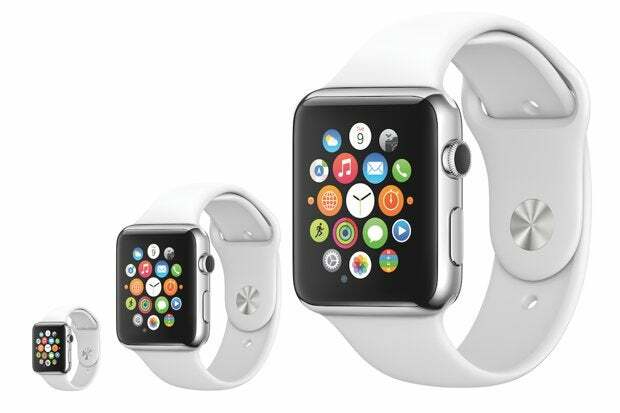 The Apple Watch will go on sale in April, said Apple CEO Tim Cook, although a date hasn’t been confirmed. DexCom’s app still needs to approved by Apple, but Valdes doesn’t foresee any holdups there. DexCom’s glucose monitoring app will eventually find its way into Android devices and Pebble smartwatches, said Valdes, but it has yet to decide which Android smartwatches to support.